The Gtechniq I1 Smart Fabric allows you to protect you interior fabrics (ie carpets, mats, etc.) and exterior (ie convertable tops, outdoor furniture, etc.) from nearly anything life can throw at it! Various areas of your vehicle can become dirty fast, especially fabrics that easily grab and hold dirt and grime. With I1, simply spray your vehicles fabrics and the nanoparticles in this high-quality formula will coat the individual fibers in a protective layer. Water and oil-based liquids are instantly repelled from the surface, that means coffee, wine, soda, blood, and more will simply roll off the surface! Wipe away any spills with a damp cloth and you will be left with zero staining! Apply I1 to your convertible tops, fabric seats, carpets, mats, outdoor furniture, shoes, clothing, and more. Best yet, the fibers remain breathable and feel soft and flexible. No sticky or plastic feeling from this formula. If you are looking for some antibacterial features, check out the I1 AB. 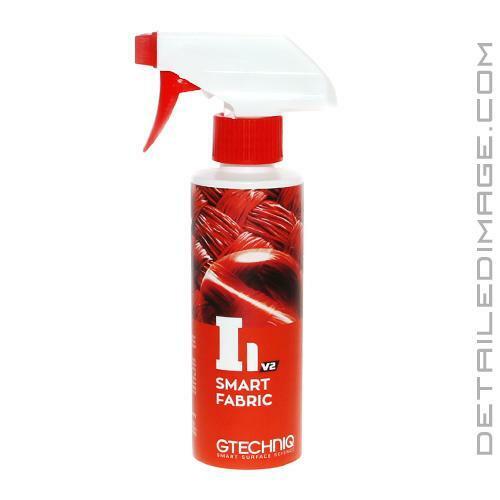 If you are looking to protect your fabric surfaces, check out the Gtechniq I1 Smart Fabric! I1 Smart Fabric protects all kinds of fabrics from water and oil based stains. It's breathable and extremely durable thanks to unique Gtechniq 3S Smart Surface Science. I1 Smart Fabric makes ordinary fabrics waterproof and easy to clean. Use it to prevent soaking, swelling or rotting on any fabric. From sails, tents and awnings to your car's soft top and interior. IMPORTANT - I used the v2 formulation (May 2018). Incredible water beading for my convertible top! I cleaned well with CarPro Reset, and nothing else. Let the top dry thoroughly. Shook well, and sprayed liberally all over. Before it could dry, I hit it again with a second coat. Let air dry for about 24hrs. It's been about a month since I applied. I wash my car weekly. It poured down rain for about 6 hours yesterday and when I walked out of the office, my top was still beading like it was when the rain started. Amazing product! I have used the 303 convertible top cleaner/sealer in the past, and this is 100% better. If I could post the images of the beading yesterday, I would, because I couldn't believe it! Great stuff! Also, for prep, I didn't tape anything off this time, as I usually would with the 303 products. The over spray on the convertible top window, side windows, and windshield was easily removed the next day with Stoners Invisible Glass. The tiny bit that got on the paint came off with CarPro EcH2O diluted into waterless wash. There was no staining on the rubber around the convertible top. Super easy and excellent results! Will use this stuff on the top annually now, and all my carpets/floor mats! Applied in a garage. Smells strong. Heavy application left some white powdery residue in some areas. Which washed off after a first rain and wipe off.